Kids Juice Corner info about the game-Games2Rule. 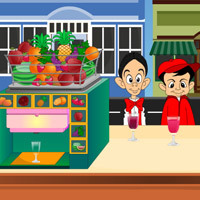 The best juice shop in the city for kids where kids queue up to buy their favorite juice .Give your kids customers their desired juice, don�t make them wait for long time , waiting time will be indicated in red, serve them before that or they will leave the shop without paying the money. Serve as many kids you can with the given time to get target money loader and move to next level. Take the money from the kids pay after they leave only then the next customer can come.